Once upon a time there was a mule called “Brother”. 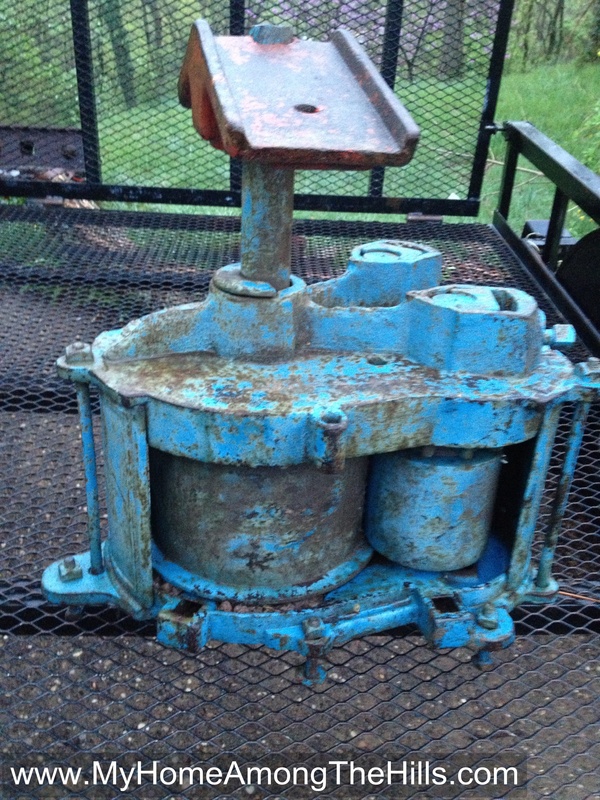 Brother was drafted into turning a cane mill for what seemed like hours on end. After becoming dirty and dizzy, he began to bray for help. Another mule called “Wife” heard his braying and decided to help. With Brother on one end and Wife on the other, the cane mill turned and turned under the hot sun. Then Wife became tired and brayed, “Why can’t I have a rope to pull this load, why do I have to push?” The farmer hooked up a rope to the cane mill. Brother pushed and Wife pulled the cane mill under the hot sun. Round and round the cane mill went while Brother and Wife became dizzy and tired. Finally, both Brother and Wife started braying so loudly that farmer had pity on them and hooked the rope to a tractor. Brother sat upon the tractor and the tractor turned the cane mill round and round under the hot sun. Wife went back and forth, carrying more cane to the farmer who sat upon the ground. The two mules said nothing to the farmer about not thinking of the tractor earlier. 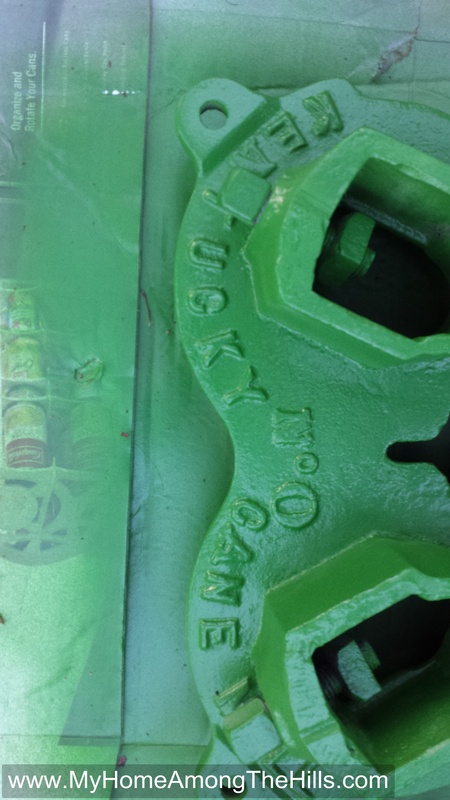 However, every time the farmer got hit in the head by the board attached to the mill’s roller, the sounds of “hee haw! hee haw!” were heard throughout the land. The plan was to process the cane I described yesterday into sorghum syrup. Basically, the canes are full of liquid with natural sugars and other magical things that give it a distinct flavor. 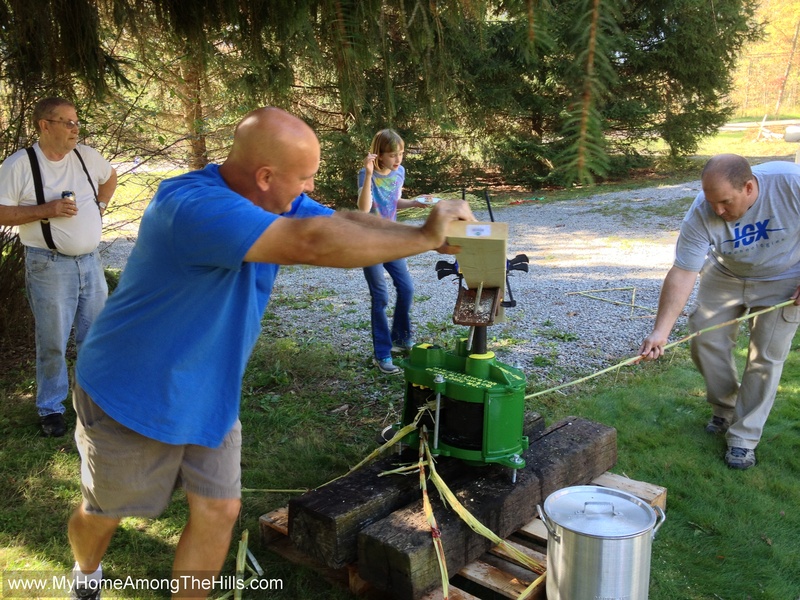 To extract the liquid, farmer Warren has to crush the cane using a cane mill. Farmers in the old days used to hitch up horses or mules to a long pole attached to the center roller in the mill. As the animals walked in circles, the rollers turned crushing cane fed into the mill a few pieces at a time. 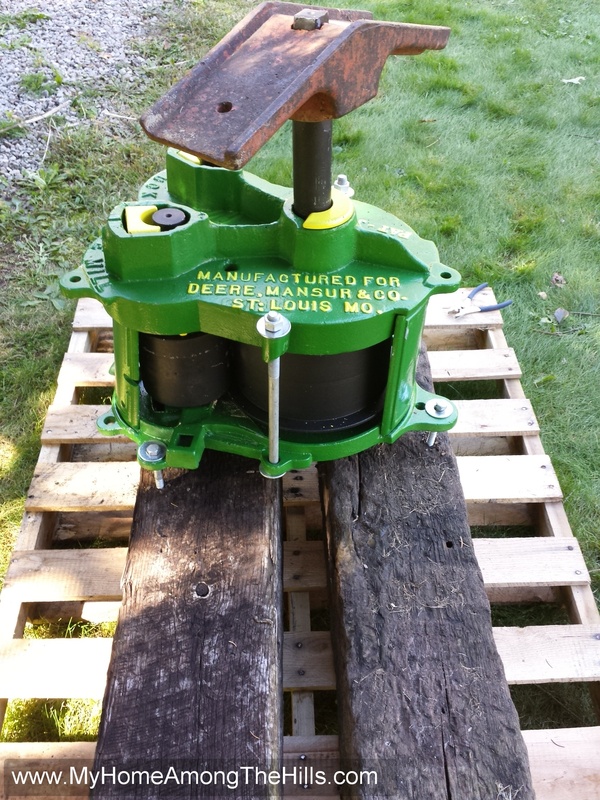 We reassembled the mill and lagged it to a few sections of old railroad ties. 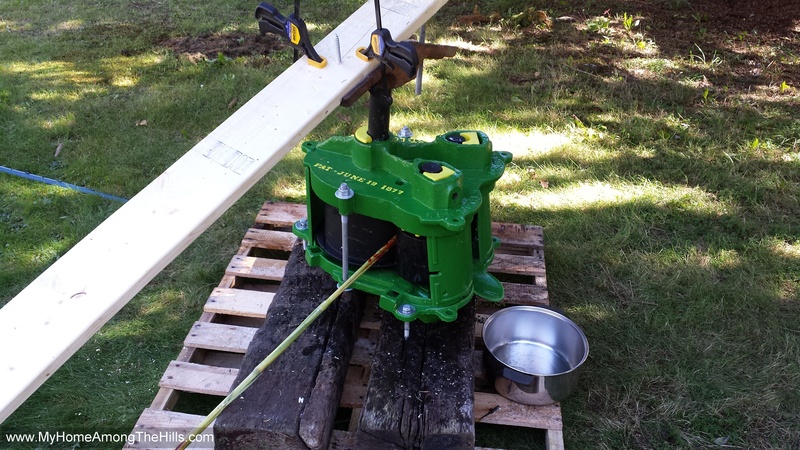 Old timers used to attach the mill to a tree stump that was quite solid in the ground. 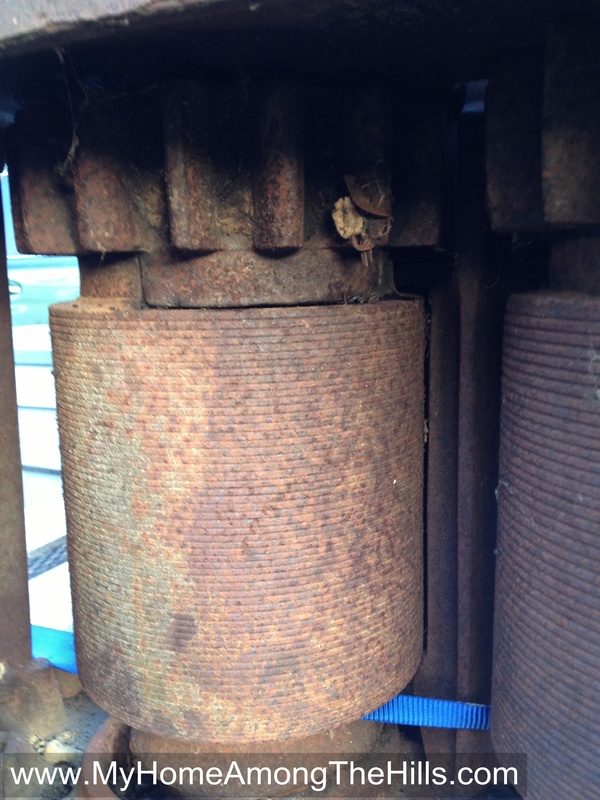 You see, when the rollers are turned in the mill, a tremendous amount of torque can be generated. If the mill isn’t attached to something solid, it will be spun around…not something I wanted to deal with as a 600 pound block of iron in motion is slightly more than I can handle. So, we got it assembled and rigged a board to the center shaft. I was the first draft animal to take a turn at the mill. It was slightly easier than I expected to turn the mill. It was frozen solid when I got it so nothing moved. I guess I had an idea that it would be only slightly easier to turn once it was cleaned up. I had not assembled it even once since restoring it so I had no idea! Luckily, it turned well so we decided to start crushing cane. We tried to run a single pieces of cane through it but it didn’t really work. The rollers are supposed to be spaced at around 1/16th of an inch. 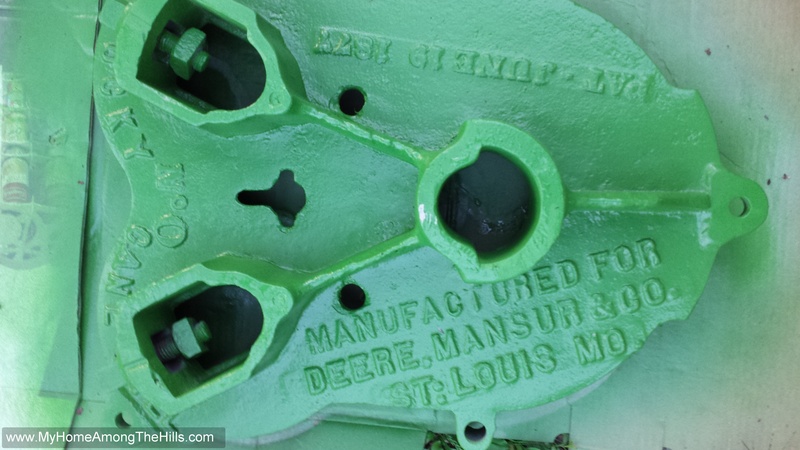 On each end of each roller, there used to be bolts that could be used to adjust the spacing of the rollers. On my old mill, I was able to free the top bolts but I couldn’t replace them (not for this year anyhow). 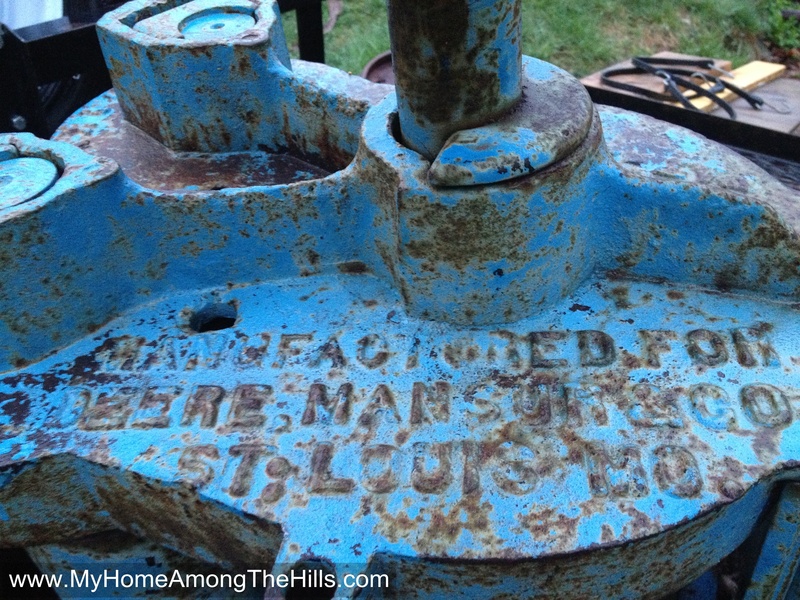 The bottom bolts remain frozen in place so I had some ability to adjust the tops of the rollers but the bottoms were set in iron…literally. 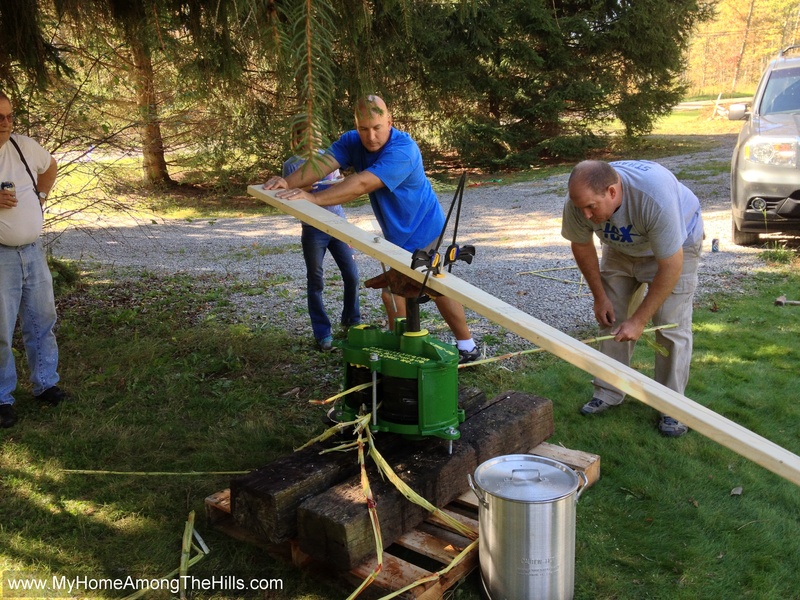 We set up the mill under a spruce tree so I grabbed a few pine cones and jammed them into the top of the mill to force the rollers closer together. Surprisingly, it worked amazingly well! The spacing at the bottom of the rollers was a little too wide so I had to be careful feeding the cane so that it went mostly towards the top of the joint between the rollers. That worked just fine but was less than ideal. That mechanical horse saved lives! But hurt my head…a lot! So, as I said, I was the original draft animal but I had the vision on how to feed the cane too so my brother, who has a mind well suited for being a draft animal, took over turning the rollers (just kidding…he has a PhD in chemistry). Really, neither job was too glamorous. After a few turns, we were both dizzy (and I swear it had nothing to do with the liquid wheat we had nearby) and decided to hook it to the motorized draft animal. I remained on the ground to feed stalk while Isaac and my brother took turns riding the tractor. 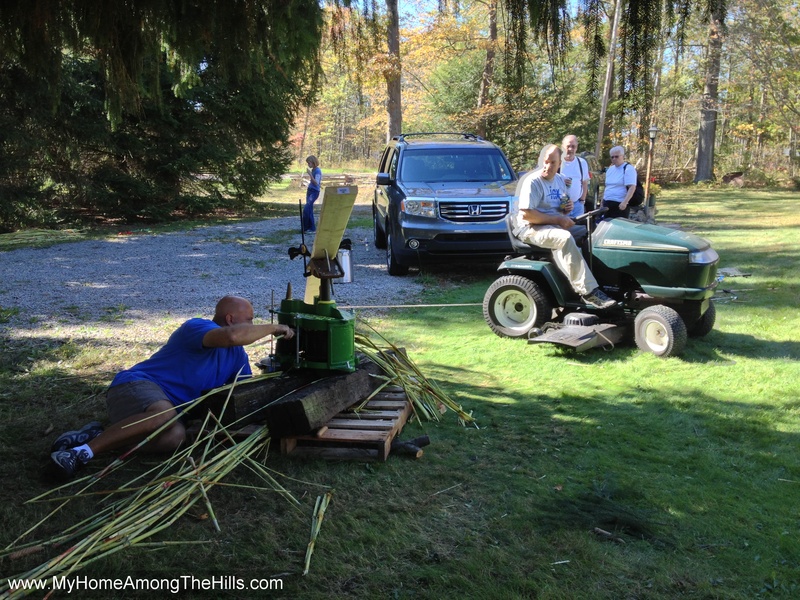 I suppose we ran cane through the cane mill for 3-4 hours slowly learning tricks and getting better at the process. We had to fight the mill a few times as I got impatient and fed too much cane. 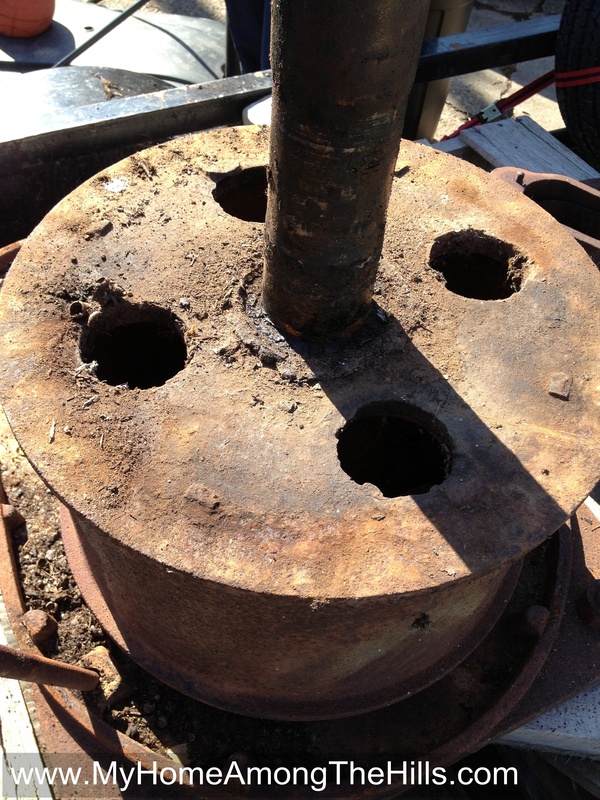 The torque increased and we spun the mill in circles…luckily we kept the mill low to the ground for safety. Next year, I will mount it higher and more substantially to make it easier to feed cane and to minimize rotation. When sorghum juice flows, it is pea green. Truly, it doesn’t look appetizing and I think it smells like the guts of a pumpkin around Halloween. Still, we got juice flowing and I was so excited. The process was working! We pressed a bunch of cane and had a nice bunch of juice to cook down. You’ll have to wait until the next post to hear about that adventure (yeah, I lied yesterday…I have to write more than 2 parts)! 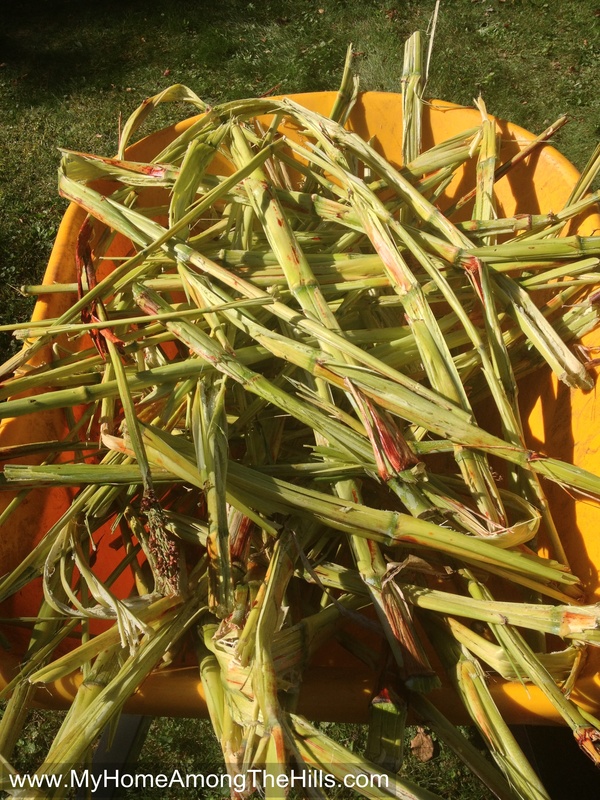 Earlier in the spring I bought a cane mill to press sorghum stalks into sorghum syrup. After that one, I bought another (click for “before” pics). When it was time, I planted sorghum seeds and proceeded to do nothing at all related to the cane mill until the last 2 weeks when I have been working furiously to break down the second cane mill (it’s smaller) and fix it up so it will actually be capable to pressing sorghum cane! 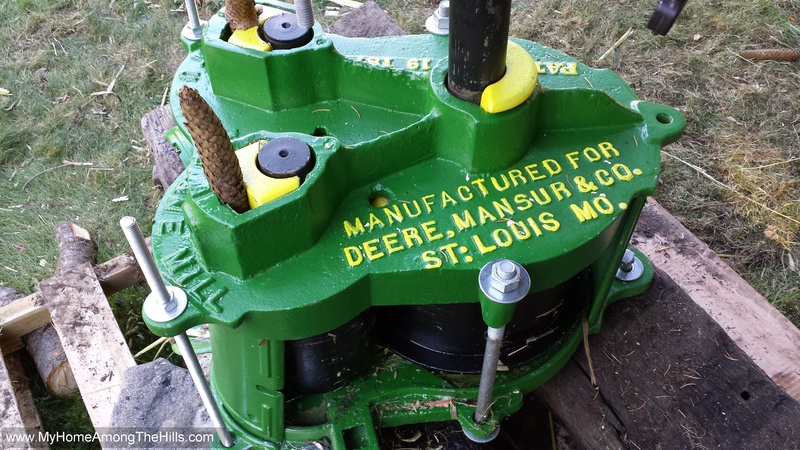 I decided on John Deere green and yellow since this is ultimately a Deere-made mill…clever, eh? 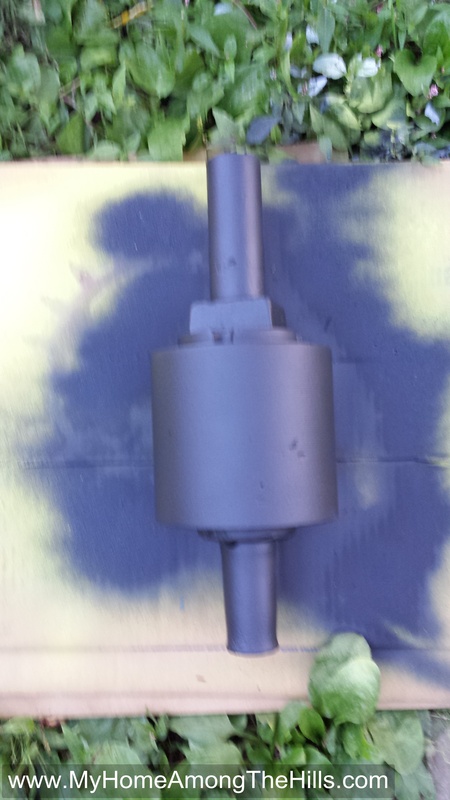 I also decided to paint the inside of the mill as well as the rollers. Some folks don’t do that but mine were already painted before I got it and modern paint, when dry, is inert so shouldn’t be a food hazard. 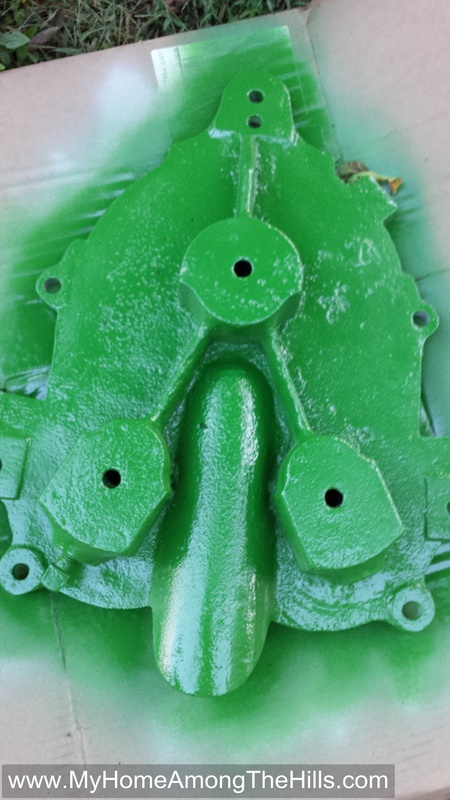 I will probably do more research and, if necessary, sand blast the paint if I decide it is a problem. Anyhow, you see, like everything, time flies and the sorghum was just doing what sorghum does…grow! It grew and grew and it seemed like I had plenty of time to get the mill ready. Here it is almost October and I am not yet ready! Sorghum is apparently ruined if the stalks are frozen so I have a fairly short window of time left to harvest. 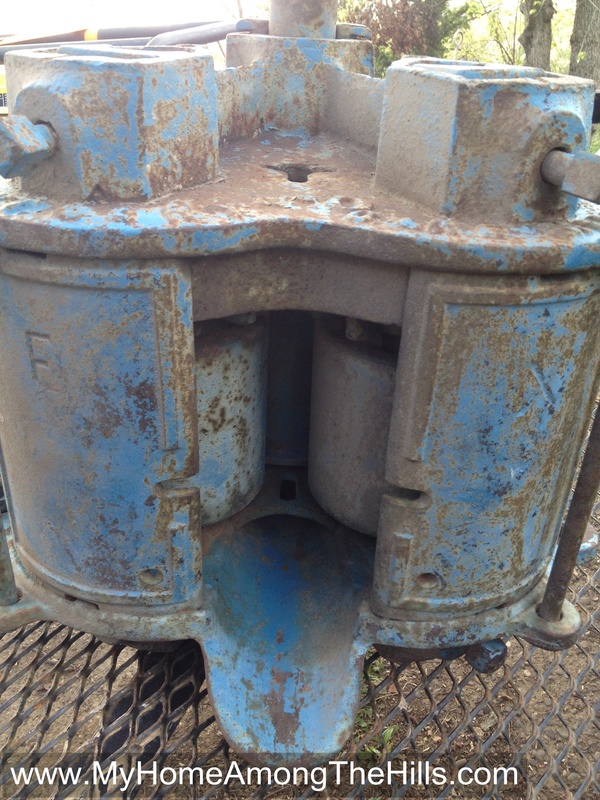 Fortunately, the mill is apart and I was able to run a grinder over a bunch on it to remove rust, dirt, etc. All in all, I think it is shaping up very nicely. These pieces each weigh quite a bit (the entire piece weighing somewhere between 400 and 600 pounds…I don’t have a scale that big and there is little info on this model. I guess I could weight the individual pieces but it doesn’t really matter) so it takes a good bit of work to manipulate them and hold them just right while I run the grinder. Still, I think the pieces are turning out beautifully. 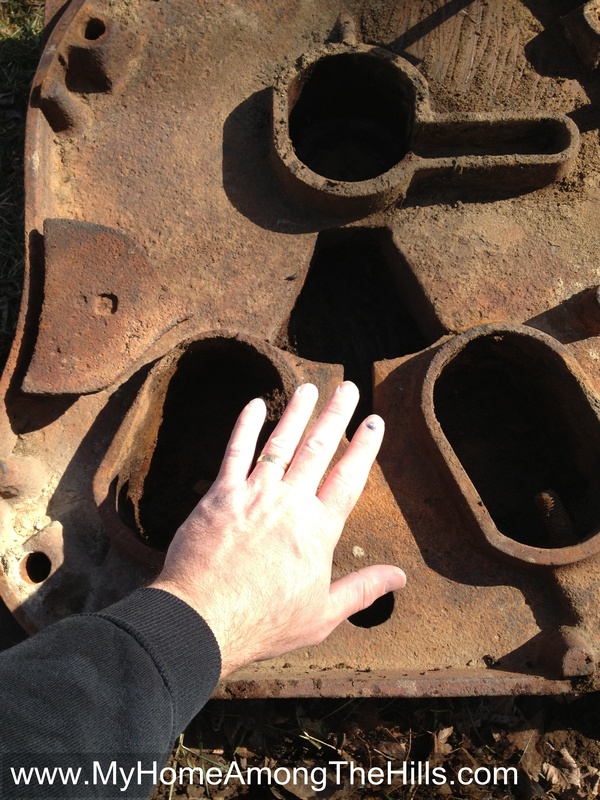 Of course, I have inhaled a lot of the rust and grime. I was so excited to just get time to work on them that I forgot to wear a dust mask. I did wear ear and eye protection though! So, I may try to harvest the sorghum this weekend or the next but the mill shouldn’t be the hold up. I’ll show some more pics when we get it back together and when we actually do harvest! 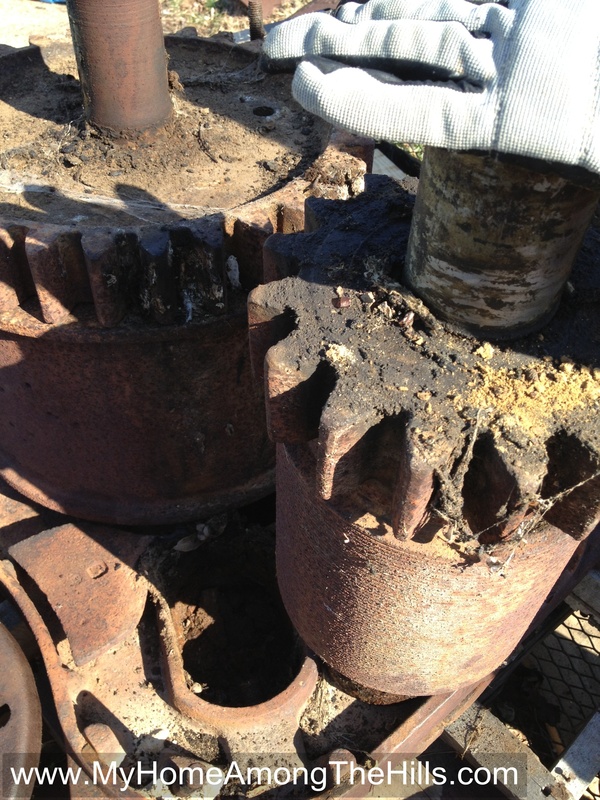 I spent a few hours this weekend working on tearing apart the cane mill in preparation of restoring it. 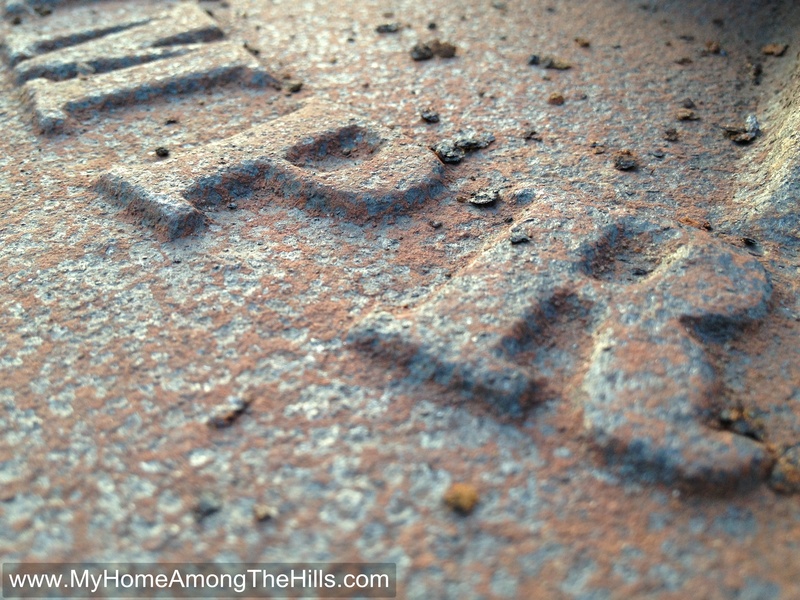 Some folks like the old rusted iron look and, too a degree, I do too, but when it comes to something I am going to use to make food, I think I would rather have it cleaned up and protected. Plus, I got to buy a sand blaster so it’s legit. Anyhow, I used lots of PB Blaster, an amazing rust buster, and delicately tapped on various pieces until they loosened up and came apart. 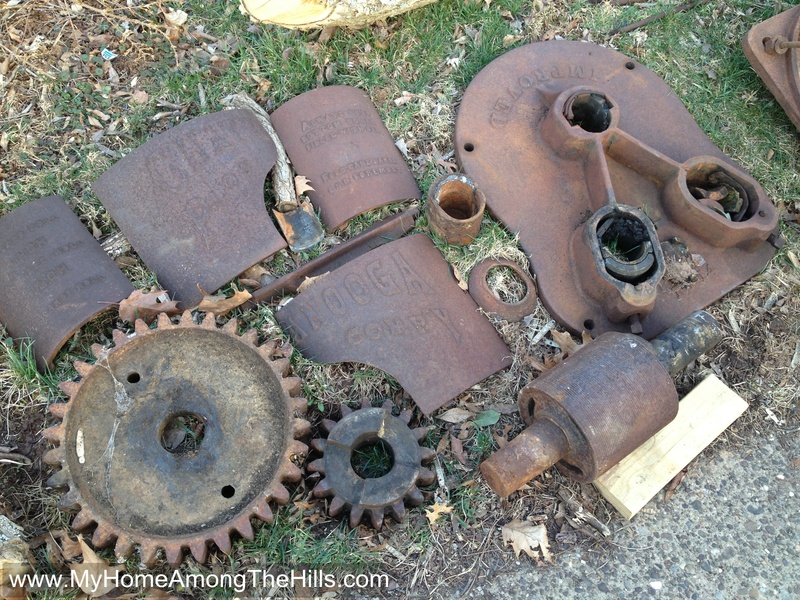 I was surprised to find out that pretty much all of the mill came apart which is fortunate because it weighs a ton! So, to make sure it makes sense, I’ll describe how it works. 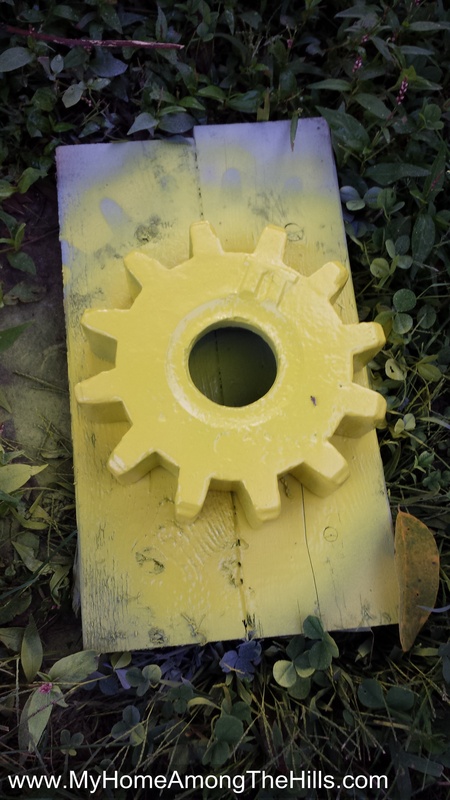 Basically there are three rollers that are joined by large metal cogs at the top. 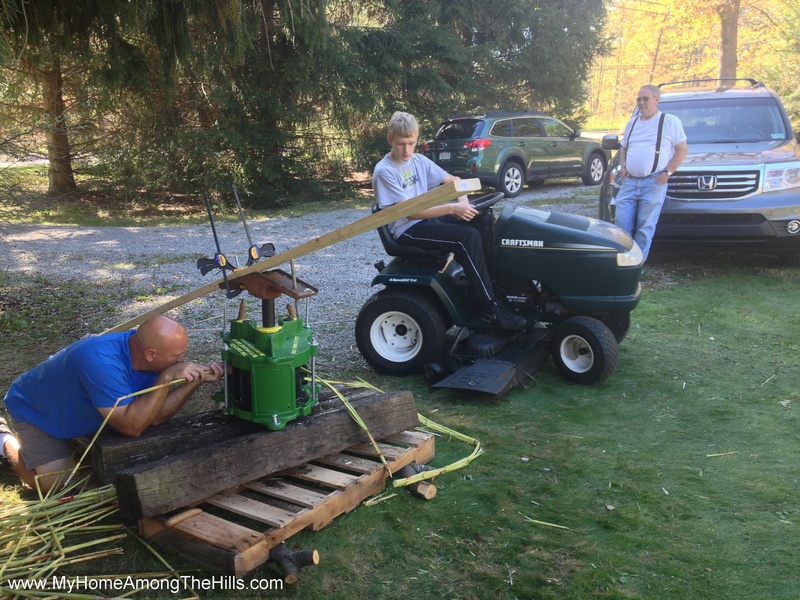 The largest roller has an iron shaft that extends above the mill to which I will attach a long pole. In this case, The Chattanooga Plow Company numbered the mills according to how long the pole should be for proper leverage. In my case, I need a 14 foot poll to go with my Chattanooga #14 mill. So, I will attach a mule (like my wife and kids) or a horse or even a 4 wheeler to the pole. The beast of burden will walk in circle turning the main shaft which will, in turn, rotate the other rollers as well. The rollers are spaced about 1/8th to 1/16th inch apart. Sorghum canes are fed into the gap. 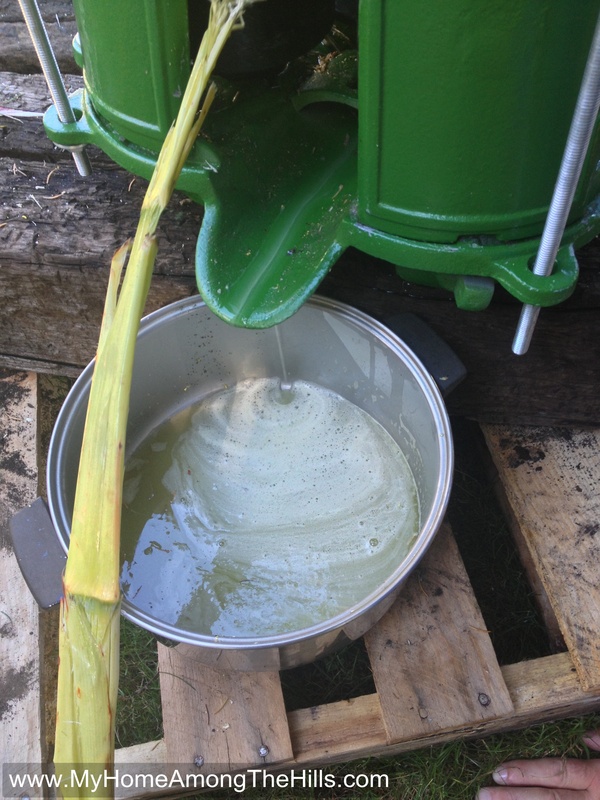 The rollers rotate and pull the canes into the mill and crush the stalks releasing the juice inside the canes. 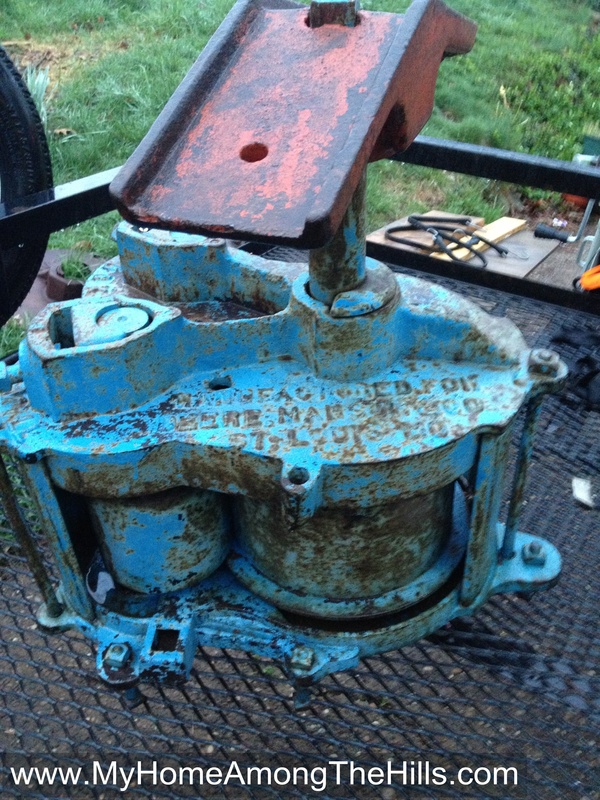 So, luckily the mill comes apart which makes my restoration much easier. I was surprised to find out that the largest roller was completely hollow. It will still more than I could lift so luckily my main mule wife helped me get it off the mill’s base. I bought a sand blaster this week and was surprised how cheap they actually are. 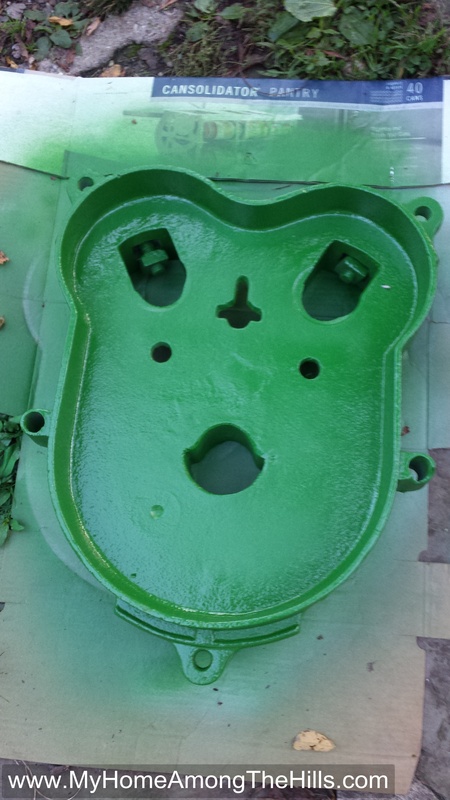 Now that I have the mill apart, I plan to try my hand at sand blasting. I also have another plan in action to remove rust also. Abigail and I are doing a little science experiment to find a chemical method to remove rust also (more on that another day). Depending on how that works, we may go that route instead, mainly because…well…science! Hey, science has ways to make lifting heavy stuff easier too, doesn’t it?